P.S. I’m starting off with a P.S. because this is my Woot & Grumble and we’ve already established that I don’t follow prescribed codes of conduct very well. When I sat down to pen my Weekly Woot & Grumble last night, I experienced mild anxiety. Why? Well, for the first time in our little blog’s life span (we debuted to zero readers in April 2014), I get the sneaking suspicion that people (other than our parents; hi Mom, Dad, Mom-in-law, Dad-in-law) might actually be reading this thing! Frugal Hound got so nervous for me that she fell over. 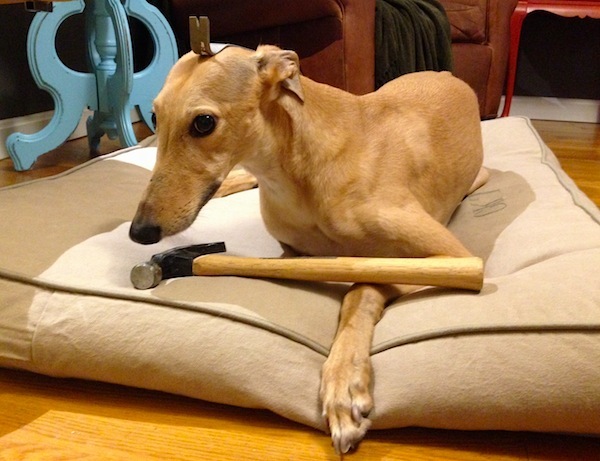 Thanks, Frugal Hound, real helpful. 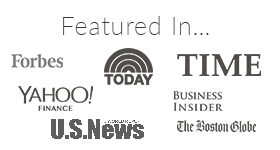 I can’t tell you how pleasantly overwhelmed and grateful I am for the kind words and support of other folks and bloggers in this space of personal finance, financial independence, and early retirement. I deeply appreciate the time you’ve taken to make Mr. FW and I feel like welcome members of your community. It’s wonderful to hear your stories and to know that we’re not the only frugal weirdos out there! This journey to financial independence can feel lonely at times and we don’t have many people in “real life” who understand our goals and decisions. Thus, I’ve come to rely on your wisdom and humor. So, thanks folks! And now I’ve got serious nerves about my writing, so thanks a lot ;)…Mr. FW just said “write like no one’s watching.” Uh, thanks, darling. The Fourth of July was an extraordinarily rainy affair here in Boston, so Mr. Frugalwoods and I spent the day reviewing our 2014 mid-year finances (am I doing OK with the “writing like no one is watching” ruse?). Although we review on a monthly basis as well, the six-month and annual retrospectives provide the most insight as they offer those gorgeous trend lines over time. We uncovered something pretty epic (for us, anyway). While we’ve always been frugal and cautious about our finances, we plunged ourselves into overdrive this spring by taking our own Uber Frugal Month Challenge. As a result, I’m proud to announce that we’ve hit a savings rate of 82%! This percentage is calculated from the amount of our take home pay that we save every month, which doesn’t include our 401K contributions–in other words, we max out our 401Ks before calculating our rate of savings. This means we’re managing to live on just 18% of our combined incomes while we sock away the rest! We were at a fairly consistent 65%-75% rate of savings for the past few years and I honestly didn’t think we could crest the ’80s without ceasing to eat or bathe. We are subsisting on cheese samples from Whole Foods and using the park sprinklers to shower, but I think it’s worth it. I jest, folks. Although those cheese samples are amazing and one afternoon we did bike to Whole Foods just to eat some. In all seriousness, we attribute most of our success to cuts in the food & household supplies region–no more restaurants and extraordinarily hawk-like monitoring of the grocery & household goods budget. This is fascinating to me because we’ve never been spenders, we just weren’t AS conscious of our cash outlay each month. But now that we itemize our expenses for all you people to pore over, we are painfully cognizant of every dollar spent! Pain in a good way! The best part about this savings rate is that it’s sustainable. We’ve cut to a point that’s comfortable and tenable for the long-term. Yeah we could save more if we didn’t drink seltzer, coffee, craft beer or wine or go on vacation or if we got rid of the rickety Frugalwoods-mobile and Frugal Hound (never!). But, we want to enjoy life and these are all elements that fulfill us in different ways. Our goal is to spend money where is matters and in ways that are meaningful. We think we’ve hit our rock bottom savings rate and it feels incredible! Plus, this rate means that our early retirement plans have accelerated. Rush of joy at writing that down! 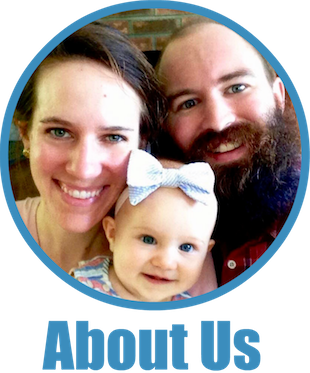 It’s tough for me to eke out a grumble when life is so good to us, so I’ll share more of an update on the Frugal House. Our lovely home is in pretty decent shape, however, it is a 122-year-old abode (stuff is old in New England). In other words, problems arise. It’s been two years since we bought our home and we’re discovering that the previous owners occasionally took short-cuts in their repairs and upgrades. 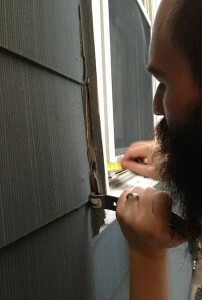 One such short-cut is the exterior window trim. 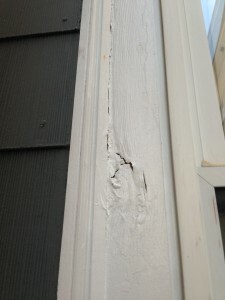 We’ve identified a bit-o-rot and it’s apparent the previous owners put wood putty over the rot and then slapped on some paint. 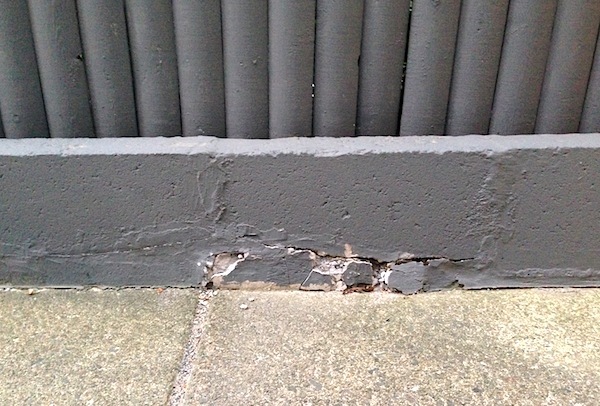 Not a major repair, but something we should attend to in our remaining 10 minutes of summer before deepest winter sets in again. Another crumbling short-cut is our concrete. I am not kidding when I say we’re surrounded by concrete–our house is literally adjacent to poured concrete in every direction. 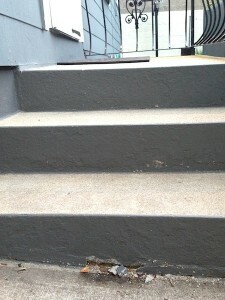 There are a few spots that were repaired at some point in the past with simple quick-mix. Turns out, patching with quick-mix doesn’t work well over time, especially in areas that are frequently wet and experience extreme freeze/thaw cycles. We plan to repair with a polymer-based concrete patcher that’s rated for this sort of application. Not significant repairs in the grand scheme of things and certainly not worthy of a full-fledged grumble, more of a petite grumble that this stuff wasn’t done correctly in the first place. On the bright side, it’s an opportunity for us to hone our DIY skills yet again! *Mr. Frugalwoods would like to share that he wrote this paragraph, which is mostly true. 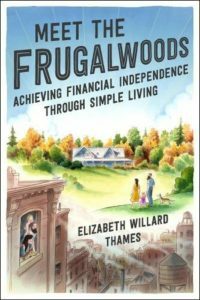 Good for you, Frugalwoods! Great savings rate! The Weekly Woot & Grumble has become a favorite of mine. Keep up the good work of unashamedly displaying your frugality. You are not alone. I grew up in a home that old too–they will always have problems, but the character you get out of a place like that makes it worth it, right? Enjoy it. I miss it! Right! I’ll keep reminding myself of that as we fix the rot this weekend :). Thanks so much for stopping by! That is a such an impressive savings rate. I would have to restrain myself from standing on the roof and shouting it at everyone who passed by. Also, no need for nerves. 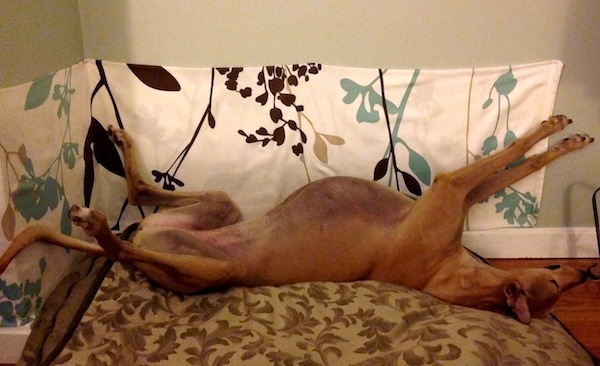 I came for the Frugalhound pics, stayed for the writing. I very much enjoy your stuff :). Thank you!! I didn’t think we’d ever be able to get over 80%, so I’m pretty thrilled! I just had a great image of me scaling our extremely pitched roof to announce the news–hah! And, Frugalhound thanks you too :). In fact, I like this stuff so much, I’ve nominated you for a Liebster Award. A small token of appreciation for providing me with inspiration and entertainment. Oh my goodness! Thank you! Wow! I am deeply flattered and Frugalhound just fell over again. She’s overcome. 🙂 Seriously, thank you! Great savings rate! Very impressive! Fun concept to be doing a weekly woot and grumble. Too bad about the rot, but at least you’ve found a longterm and durable solution. PVC windows will last you a lifetime! Thank you! The 82% savings is post taxes. Thanks so much for stopping by! I’m in love with Frugal Hound. He’s very talented. Or is he a she? We bought our house in November of 2014 and this winter we are making note of all of the cold drafts and doing something about it this summer. After all, we bought a 200 year old house that used to be an orchard farm; one original apple tree still exists in the property. Sounds like a beautiful place to live! 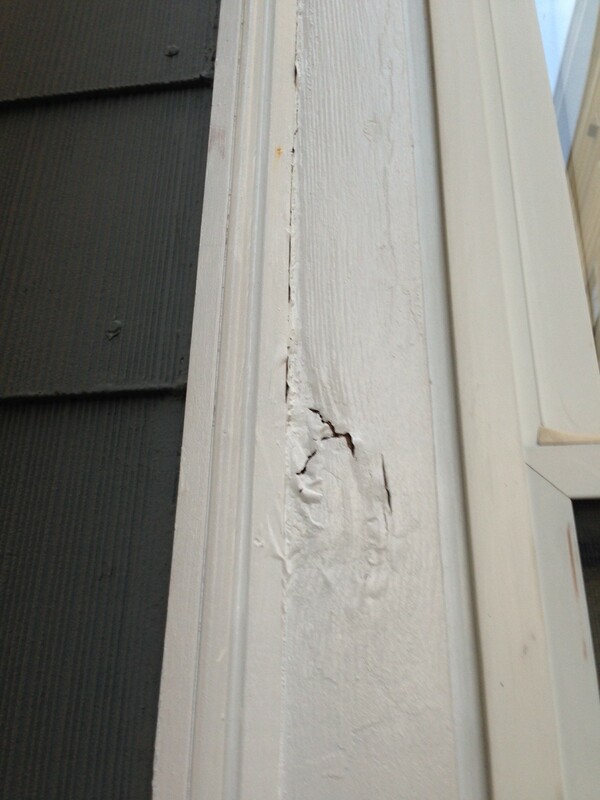 And, you’re smart to note where the drafts are–there’s definitely a lot you can do with caulk and weatherstripping. That’s amazing! Does the “spending rate” include mortgages?